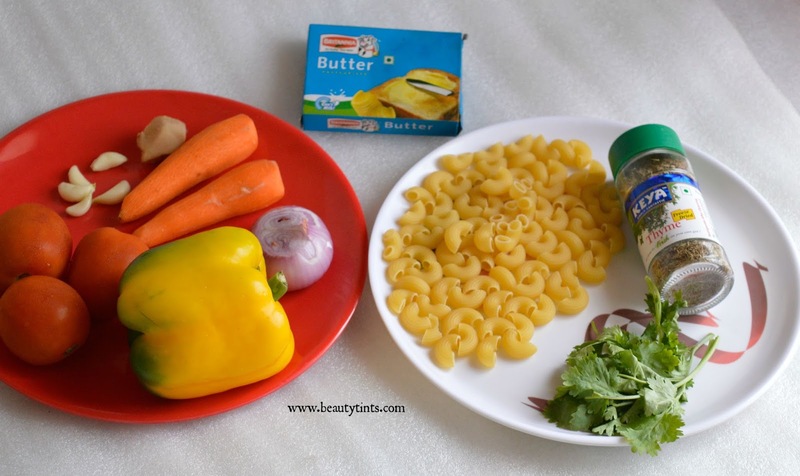 Sriz Beauty Blog: Melange Pasta with Del Monte #ItalianEscapades!!! I love to try different recipes with Pasta.I always try to mix and match the ingredients to create a new recipe.And in that process I made a fusion of Indian and Italian ingredients to make this Melange Paste (a varied mixture),which turned out very well and I was successful in making my husband to eat pasta,who always says Big NOOO to Pasta!!! So,today I am sharing my successful experimental dish MELANGE PASTA Recipe as a part of Del Monte #ItalianEscapades .This is super easy to prepare and require simple and easily available ingredients. 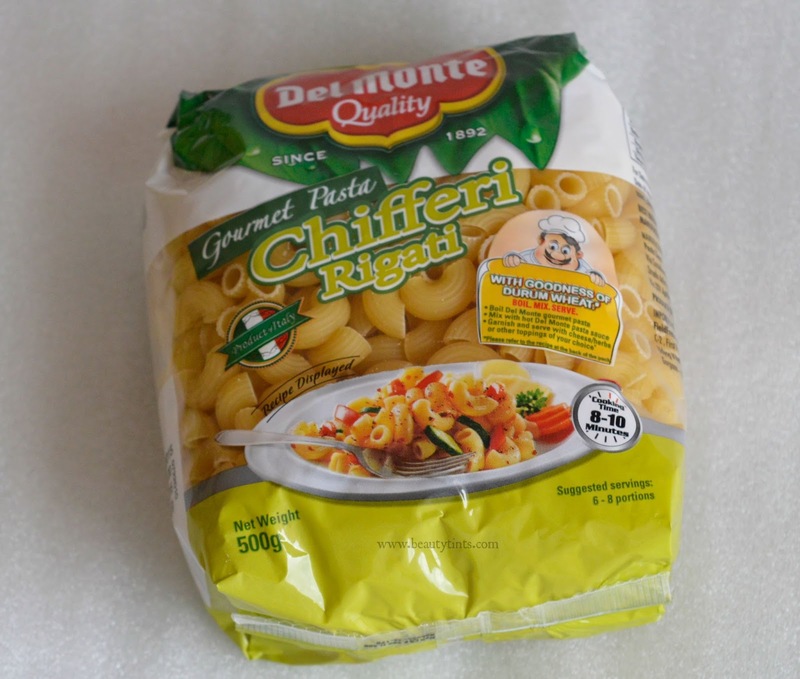 I am using Del Monte Chifferi Rigati Pasta for this recipe. 1) Dried Red Chilies : 3-4 no. 1) Take a wide mouthed pan onto a stove and switch on the flame,Add a tsp of mustard oil and allow it to become hot,then add all the three special powder ingredients Dried red chilies,Bengal gram and cinnamon and saute it till the color of bengal gram changes slightly,it takes approximately 5-6 mins.Switch off the flame and allow it to cool. 2) Then take the roasted and cooled ingredients into a mixer grinder and grind roughly into a coarse powder (granular powder).Remove it into a bowl and keep it aside. 1) In a small bowl add enough water (tomatoes should immerse in it) and place it on a stove and switch on the flame.When the water gets boiled,then switch off the flame and add tomatoes into the water and place a lid over it. 2)Meanwhile clean,peel off the skin and chop onion,carrots into small pieces. 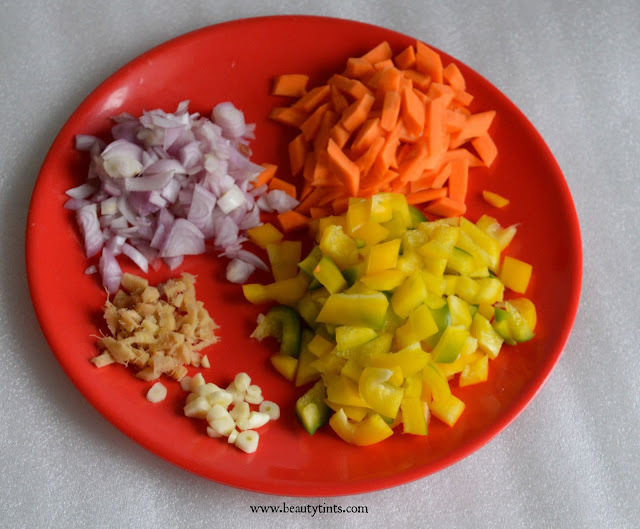 Chop Capsicum(I have used yellow capsicum) into small pieces.Chop ginger and garlic finely and separately. 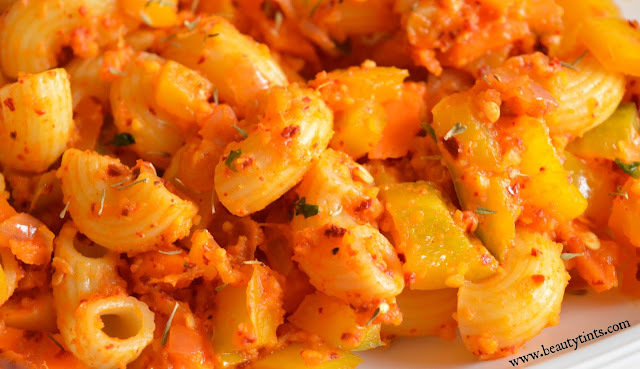 3)After 10-15 mins,peel the skin of tomatoes and cut it into pieces and take them into a mixer grinder,add few pieces of chopped ginger to it and blend it into a puree and take into a bowl,keep it aside. 4) Take another clean wide mouthed pan on to a stove,switch on the flame and add 3 cups of water ( 3 times the quantity of pasta), a little salt and few drops of oil. 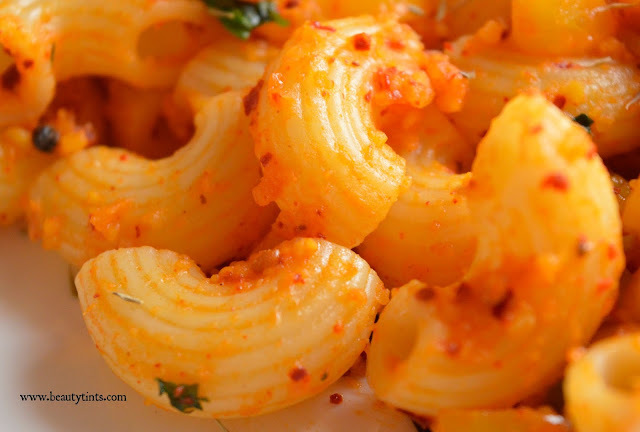 Allow it to boil.Once it starts boiling,add 1 cup of Pasta (120 gm) into it and boil it till the size of the pasta doubles it takes approximately 10-11 mins. 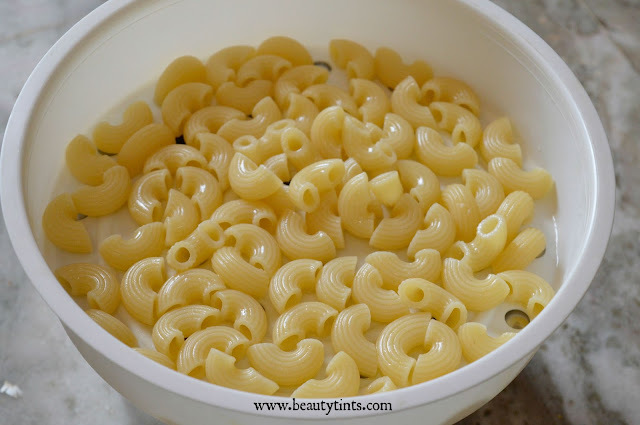 5) Now drain the water from the pasta in a sieve or colander and keep the pasta aside. 6) In the same pan or another fresh wide mouthed pan,add 1 tbsp of butter and when it melts,add chopped ginger and garlic.Saute it for a minute.Then add chopped onions and saute for 1- 2 mins or till they turn transparent. 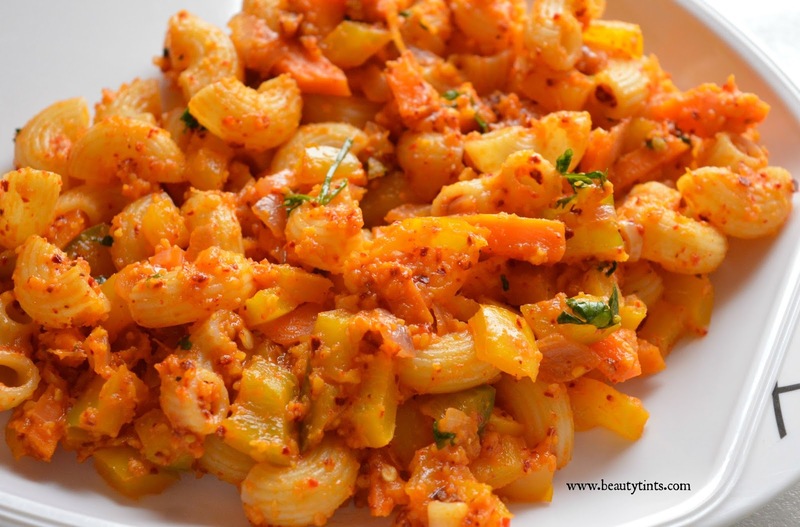 7) To this add,chopped carrot and capsicum and saute for few minutes. 8) Then add tomato puree which we prepared before, salt and special powder one by one and add a half cup of water( or can add water into special powder and use the mix like a sauce).Saute for few minutes. 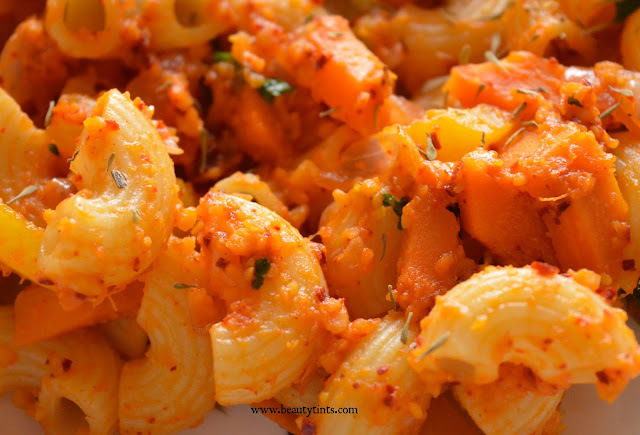 9) Then add chopped coriander and switch off the flame.Wash the boiled pasta with cool water,so that the pasta gets enough moisture to absorb the sauce or mixture.Add this washes pasta to the vegetables and mix thoroughly. 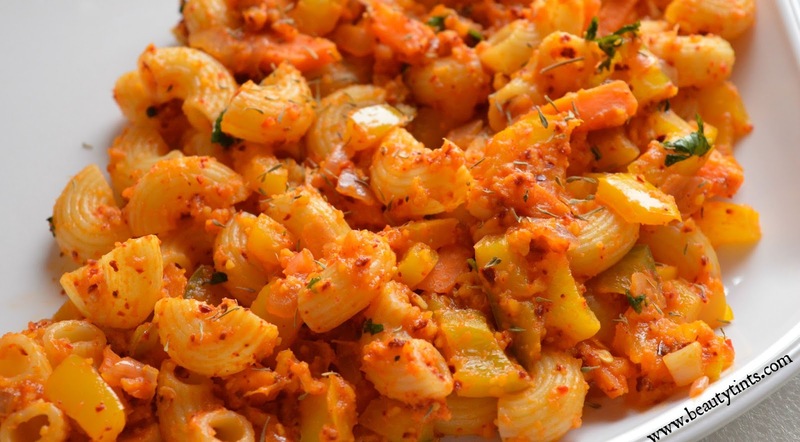 10) Our Melange Pasta is ready to serve. 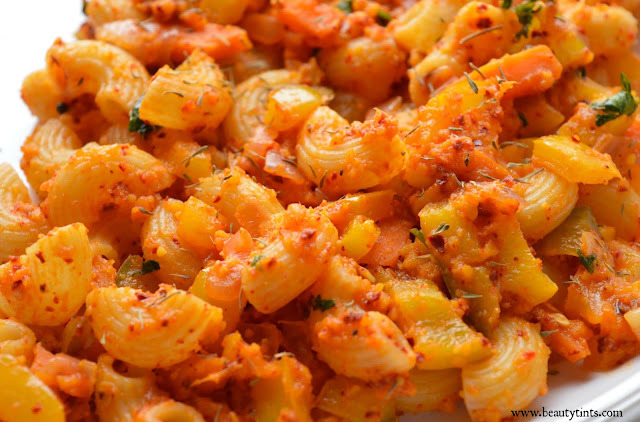 Dish out into a serving plate and garnish with thyme, serve the delicious MELANGE PASTA!!! 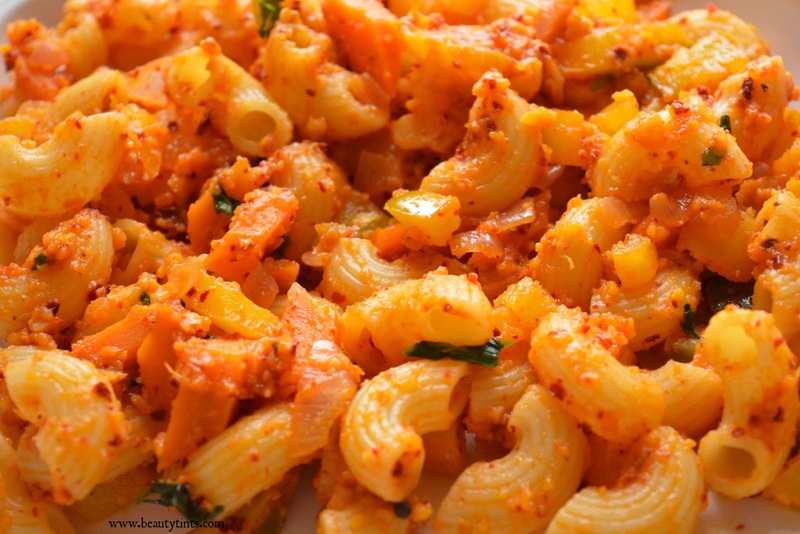 This recipe also includes Indian ingredients like Bengal gram,cinnamon and coriander leaves.Though it may not be entirely Italian,but I am super happy that my husband loved this Melange Pasta and also for the successful recipe. Hope you liked this.Please share your opinion on this in the comment section below!!! Labels: #ItalianEscapades, delmonte, Melange Pasta with Del Monte #ItalianEscapades!! !